JAMMU, Sep 14: Former Minister and Congress leader today criticised the callous attitude of previous BJP PDP government for not showing its serious concern towards demands of teaching fraternity. While addressing a SSA,ReT teachers who were sitting on dharna showed his serious concern and resentment over continuous delay in resolving the legitimate demands of SSA,ReT teachers. 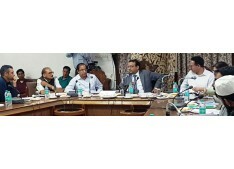 Sharma said that while implementing the Seventh Pay Commission the State Government showed double standard by depriving 40,000 nation builders from the benefit of Seventh Pay Commission and in implementing the Seventh Pay Commission and for the last two-three years teachers are continuously on the roads that too for regulation of their salaries which is shameful and unfortunate. He said thousands of teachers in the State, hired under the Sarva Shiksha Abhiyan (SSA), are on an indefinite strike to protest against the Government for adopting delaying tactics in implementing benefits of the 7th Pay commission to them and delinking their salaries from the component paid by the Union Ministry of Human Resource Development. “It has been 16 days since these teachers went on indefinite strike and some of them are on hunger strike, but the Government, it seems, is not bothered to solve their long pending demands. Though in the past five months, the Government constituted several committees to look for measures to address their issues, nothing has been finalized till now, which has forced them to go on agitational path, ” Sham added. 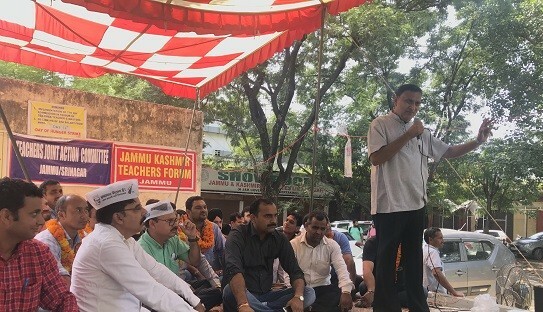 While urging the Governor led to fulfill the demands of Sarva Shiksha Abhiyan (SSA) teachers ,ReT at the earliest, Sham said it is unfortunate that nation builders are being forced to come on roads to demand their dues.